Stems: Erect, slender, straight, often branched, glabrous, waxy; somewhat succulent; 2-6 nodes, internodes to 10 inches long. Leaves: Alternate, firm, linear-lanceolate, 3.5 to 12 inches long and .15 to .5 inch wide, glabrous, waxy, often folded. Inflorescences: Cyme, umbel-like, few to many-flowered, teminal on stem or branches; bracts leafy, glabrous, 2 to 8 inches long. Flowers: Sepals 3, elliptic, pointed, glandular-hairy, margins sometimes purplish; petals 3, broadly egg-shaped, bright blue to rose or magenta; stamens 6, filaments bearded; stalks up to 4/5 inch long, sparsely glandular-hairy. Fruits: Capsule, nearly spherical to oblong-ellipsoid,; seeds 2-6, compressed, gray. Habitat: Prairies and disturbed sites; dry sandy or rocky soils. Distribution: Principally in the west 3/4 of Kansas. 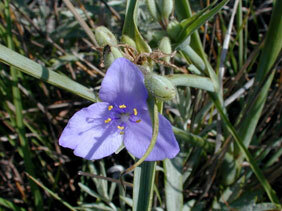 Uses: Several Native American tribes used the young shoots of prairie spiderwort as a food source. Comments: Three other spiderworts are observed in Kansas: common spiderwort , bracted spiderwort , and Tharps' spiderwort .